Hi! I am Alexandra Carruthers Ferrero. I am currently an undergraduate physics major at the University of Puerto Rico, Río Piedras Campus. This summer, I participated in Harvard T.H. 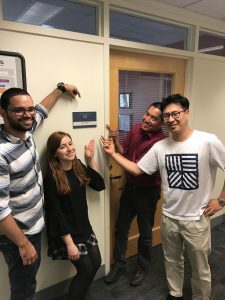 Chan School of Public Health‘s Summer Program in Biostatistics and Computational Biology through IDI-BD2K (Increasing Diversity in Interdisciplinary Big Data to Knowledge). 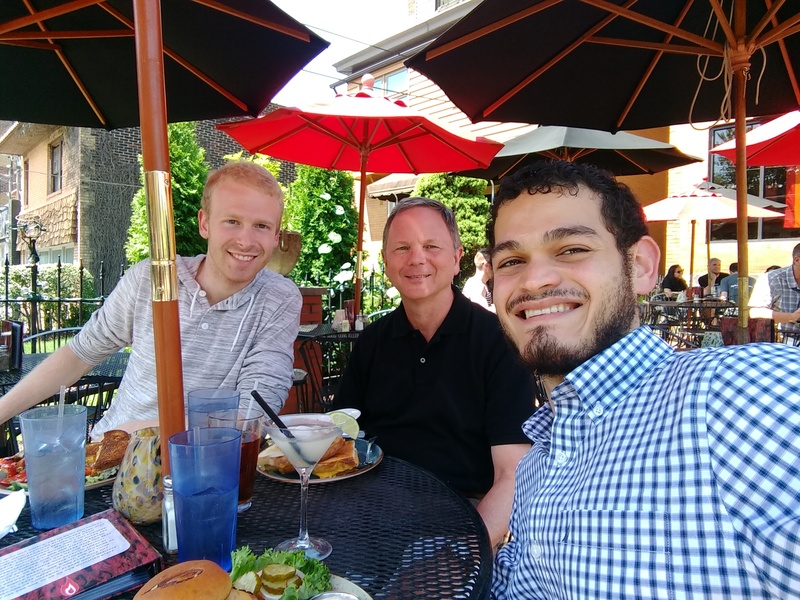 Thanks to this incredible opportunity, I was able to work on a public health research project under the mentorship of Dr. Cory Zigler and Dr. Chanmin Kim. The project focused on tracking air pollution from coal power plants throughout the United States. We worked with time-varying data to construct linear regression models and learn how the emissions of certain power plants spread and impact populations throughout the country. Traditionally, chemical and physical models are used to study the spread of air pollution. Therefore, another key point of our project was to compare the results of a purely data based statistical model with those of chemical and physical models. In addition to working on a research project, the program provided us with professional workshops and courses in biostatistics and epidemiology. I cannot say enough how grateful I am to have had the opportunity to take classes and research in the school of public health this past summer. It provided an environment for not only professional but also personal growth. I wholeheartedly recommend others to participate! 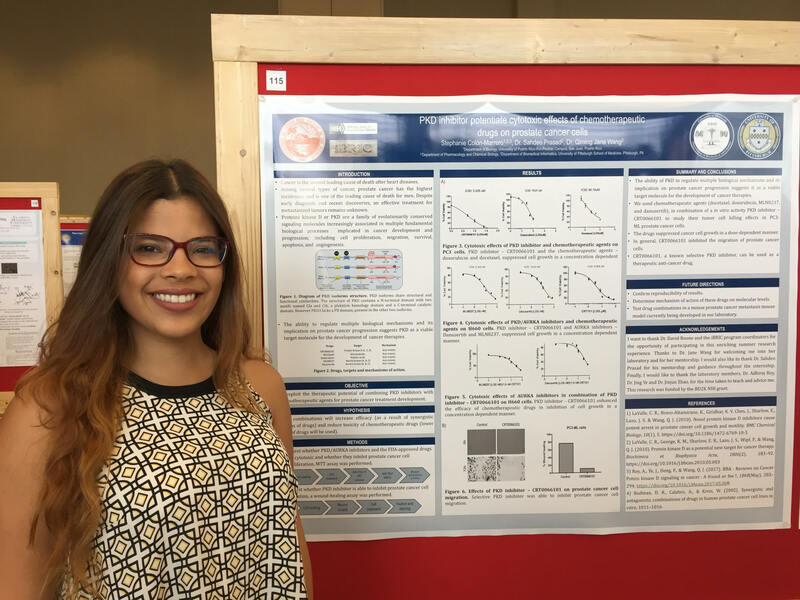 My name is Stephanie Colón Marrero and I am a Biology undergraduate student at University of Puerto Rico, Rio Piedras Campus (UPR-RP). This past summer I participated in the Internship in Biomedical Research, Informatics, and Computer Science (iBRIC) from the Department of Biomedical Informatics at the University of Pittsburgh. I had the opportunity to work alongside Dr. Qiming Jane Wang and Dr.
Sahdeo Prasad, from the Department of Pharmacology and Chemical Biology at the University of Pittsburgh School of Medicine, on a research project that aimed to exploit the therapeutic potential of combining protein kinase D inhibitors with chemotherapeutic agents for prostate cancer treatment. We first studied the potential of these drugs to inhibit cell proliferation and cell migration, fundamental biological processes implicated in cancer development and progression, by performing cell viability and wound-healing assays, respectively. Our findings contribute to a mouse prostate cancer metastasis model currently being developed in the Wang laboratory. At the end of the program, I participated in the Summer Research Symposium at Duquesne University. I encourage every student interested in bioinformatics and biomedical research to take part in the research opportunity offered by the Increasing Diversity in Interdisciplinary Big Data to Knowledge (IDI-BD2K) program. Participating in research programs, like iBRIC, provides valuable tools that could improve significantly your personal and professional growth. Hola soy Israel O. Dilán-Pantojas, estudiante del programa de bachillerato de estudios generales, tengo la meta de completar una segunda concentración en Ciencias de Cómputos. 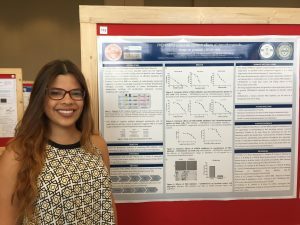 Este próximo año sería mi 7mo año de estudio en la Universidad de Puerto Rico, y actualmente participo activamente en grupos de investigación de Biomedicina y Bioinformática. Este verano he estado trabajando, con investigación en el campo de Descubrimiento Causal con modelos gráficos, en el Centro para el Descubrimiento Causal bajo la tutela del Dr. Greg Cooper y la mentoria del estudiante graduado Bryan Andrews. Este campo busca identificar correctamente la orientación de de relaciones de causalidad, es decir si un agente o causa A controla el resultado de una variable dependiente o efecto B. Ósea, A y B no están casualmente relacionado (A B), A causa B (A -> B), B causa A (A <- B) o ambos A y B están mediados por otro agente que los causa a ambos (A<->B). Actualmente los algoritmos que hacen este trabajo están limitados identificando ciertas orientaciones causales como A — B — C, ya que la misma es equivalente en los siguientes tres casos A –> B –> C, A <– B –> C, A <– B <– C. Nuestro trabajo busca poder distinguir entre estos tres casos utilizando información de intervenciones llevadas a cabo por los investigadores y representadas como variables diferentes en los modelos, lo que nos permitirán orientar con certeza este tipo de relaciones causales. Hi! 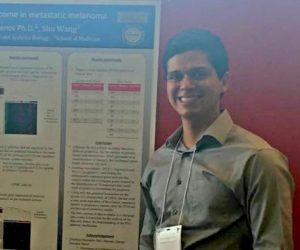 I am Andres Lopez Rivas, a Biology undergraduate student at the University of Puerto Rico, Río Piedras campus. 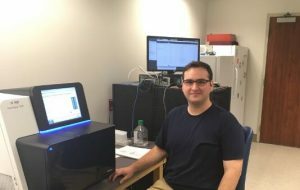 Thanks to the IDI-BD2K program, I am currently on an Internship in Biomedical Research, Informatics and Computer Science (iBRIC) at the University of Pittsburgh. Working with professor Takis Benos, I collaborated with graduate students on a groundbreaking research, examining gene expression and pathway analysis involved in resistance to PD-1/PD-L1 immunotherapy on melanoma patients. We are trying to identify biomarkers that can predict the outcome of the patient’s cancer when the immunotherapy is delivered. Understanding the mechanism involved in this immunotherapy is not only important in melanoma patients but also in numerous cancer types like kidney, bladder, non-small cell lung and others since the pathway that this therapy triggers governs in a multitude of cancer types. Nowadays the researchers of medicine, as well as researchers in other branches of investigation, must assume a more interdisciplinary role to encompass the challenges and find a solution. This program not only deepened my knowledge in biology, mathematics and computer science but also gave me the tools to apply it to problems that every researcher in my field faces. At the end of the week all of the interns will be presenting a poster at Duquesne University along with other interns from different programs. Although it has been a challenging 10 week internship, my colleagues and I have been enjoying every minute of it by going to baseball games, festivals, museums, theaters, concerts and many other things the city of Pittsburgh has to offer. Andres Lopez presenting his poster. research project in UPMC Shadyside Hospital as part of the University of Pittsburgh and DBMI program iBRIC with my mentor William LaFramboise. Here I worked in my first sequencing lab, having the first-hand experience of having your data created right next to you is an amazing feeling, it’s like getting bread right out the oven. I’m working with papillary renal cell carcinomas which are rare form of kidney cancer that have been sub-classified into type 1 (PP1) and Type 2 (PP2) based on phenotypic differences. Here we were tasked to find molecular difference between these two classes. By then comparing these data sets we could later infer a pathway for each type, such that we can then distinguish main drivers and differences of both subclasses. We worked with expression data, CNV’s, SNP’s and indels, and used tools that were all new to me such as Galaxy (VarScan), Nexus, NIH David, Genome Oncology Browser and IPA (Ingenuity). This hands-on approach to all these tools was a great experience and facing hurdles along the way just motivates you to keep going and not make mistakes. Pittsburgh is a great city filled with amazing and lovely people and every corner seemed to be an adventure. I also attended many conferences and talks where I learned of new technologies like Tetrad, learned about graduate school and how to improve my skills in presenting and overall skills associated to my field. I made great friends and contacts that will help me in the future to become a better person and professional. Louis Gil in his work area at UPMC Shadyside Hospital. The IDI-BD2K project is supported by grant R25 MD010399 from the National Institutes of Health.